X-Men has impressed many a reader this week, and I have been looking forward ever since seeing the above cover in the previews. Its always enjoyable to see a decent team shot and this one is no different. Instead of the regular standing in an abstract formation we have the characters scattered in a unique pose. The ladies are organised around a sentinel head, giving the impression they have recently taken it down in battle. The dominant x-men are central and Storm stands upright and to an angle with stern face, whilst Rogue stands alluringly with hand on hip and a wry grin. Rachel seems more distracted and behind the scenes as she is standing to the side and obscured behind Storm and Rogue. Kitty has fists clenched, side twisting pose with a leg leaning on the Sentinel. Her pose is quite serious but we all known Kitty is trying to hold down her natural grin. There are no indications that Jubilee is a vampire but she does sit perched on the head and giving a V sign with her left hand, revealing her playful juvenility. Finally we have Betsy who sits with her legs apart, hands resting on her sword which stands between. The pose is almost sexually intimidating and completes the range of female X-men of the comic. Note must be made of the colouring by Laura Martin who has given the cover a post battle fire fanned feel to it with the flames in the backdrop of the fallen sentinel. The cast are then coloured subtly but brightly depending on their outfits giving a nice range of tones. 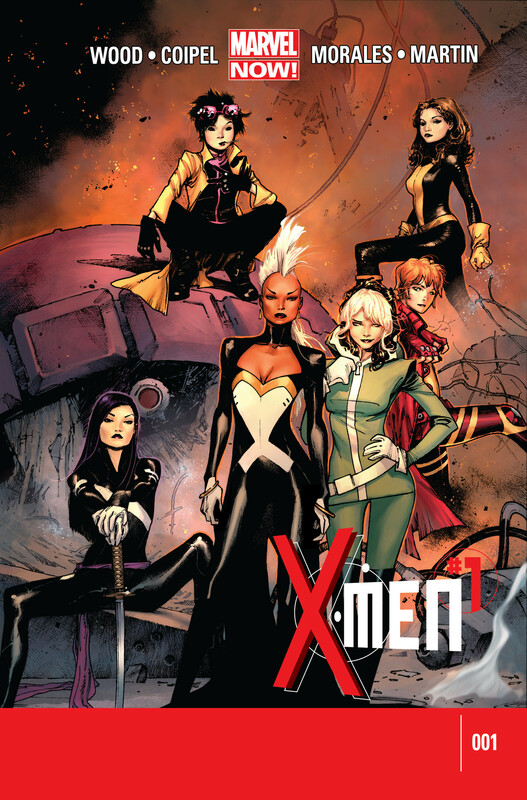 It is an impressive cast and the cover depicts an epic display of the ladies of X.
I almost bought two copies of this issue, just so I could get this cover. But I’m cheap, so I only went with the Skottie Young variant, because Skottie Young. What a fantastic choice for cover of the week! X-Men #1 was brilliant. I like the way this cover captures the personality of each of the characters, with the ladies standing around the Sentinels head. A stunning cover!